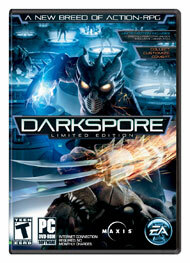 <br>Join the sci-fi universe of Darkspore, a new breed of Action-RPG in which you battle across alien worlds against a deadly foe. Collect an arsenal of living weapons - genetic heroes with different combat abilities - and upgrade them with tens of thousands of collectible body parts and armor utilizing technology from the award-winning Spore Creature Editor. Fight in co-op and solo battles against hordes of genetically mutated Darkspore enemies and bosses, or in PvP arena battles against other players.